Andrew Ellis - Artist: he was drawn to studying wildlife, and in particular birds of prey, which remain one of his favourite subject matter. Andrew’s passion for painting the natural world demonstrated itself at an early age. Growing up in rural Devon, he was drawn to studying wildlife, and in particular birds of prey, which remain one of his favourite subject matter. He continues to live in the South West, with his wife Donna, and their two children, and is still very much inspired by the surrounding wildlife. He is actively involved in countryside management, releasing Grey partridges with the help of local farmers, a regular contributor on bird forums, and works closely with organisations such as IAF (International Association of Falconers), and BFC (British Falconer’s club) to raise the awareness of falconry around the world. In 1991 Andrew held his first solo exhibition at the National Falconry fair, and has enjoyed much success exhibiting there regularly over subsequent years. It was also here that he met a number of major wildlife artists including Alan Hunt, who became a source of inspiration for his work. 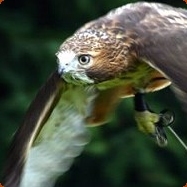 Andrew’s work has been featured in many falconry, shooting and wildlife publications, his work is collected worldwide and he has had exhibited as far a field as the Middle East, America and Europe. He is also a regular contributor to “Birds in Art”, a show organised annually by the Leigh Yawkey Woodson Art Museum , which seeks to present the best contemporary artistic interpretations of birds and their related subject matter. Since 1997 Andrew has been working with the prestigious London based gallery, the Halcyon, where he has featured in many of their wildlife shows, and in 2007 he had a very successful one-man show with them, where his work included Gamebirds and Middle-Eastern subjects. 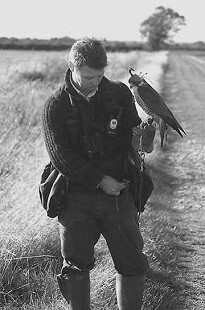 He continues to work on the illustrations for “Peregrines of the World”, contributing authors to which include, Professor Tom Cade, Professor Clayton white and Jim Enderson, This volume will follow the Highly successful Book, “ Gyrfalcon” by Emma Ford which featured many of Andrew’s paintings. His recent work has included portraiture for Royal families in the Middle East. Andrew travels around the world in pursuit of wildlife references, the places he has travelled to for inspiration, include: North America, Botswana, South Africa, and the Middle East. He has recently returned from North Africa and is currently working on a series of paintings from the region. A big thank you to Andrew Ellis who has donated a signed print, which will be auctioned to raise funds for the sanctuary.